Bluesound Powernode 2i review | What Hi-Fi? Although its talents were taken into consideration when awarding the second-generation Bluesound suite three consecutive Product of the Year titles, we didn’t actually write a stand-alone review of the Powernode 2. The reason for this omission was that we believed it shared its skillset with the Node 2, but with the bonus of on-board amplification. The fact you’re reading this review of its successor, the Powernode 2i, suggests that the differences between the 2i models are more marked. The Powernode 2i doesn’t only sound better than pairing the Node 2i with a typical £300 amplifier, but it betters its stable mate’s five-star performance for what is effectively the finest just-add-speakers hi-fi system for less than a grand. The improvements made to the Powernode 2i are similar to that of the Node 2i. Outwardly identical and using the same 32-bit/192kHz DAC and 60W HybridDigital amplification system, it is difficult to understand how the sonic differences can be so pronounced. In fact, the gains appear to be based around trickle-down high-end circuit board design from the NAD Masters M50.2 BluOS network streamer and a smaller wi-fi chipset, with Bluesound’s engineers optimising the layout and isolation from there. The Powernode 2i also adds a second Toslink 3.5mm optical/analogue input to its USB, stereo speaker and subwoofer outs. Otherwise it looks more or less identical, and the design, despite being four years old, still looks effortlessly fresh. What looking at its chassis doesn’t reveal is the inclusion of Apple AirPlay 2 and Alexa Voice Control support as well as two-way aptX HD Bluetooth for streaming and facilitating the Powernode 2i’s use with a pair of wireless headphones. Having connected to our network via ethernet, we plug the Powernode 2i into our reference ATC SCM50 speakers, as well as something more price compatible in the form of Mission’s QX-2s and Monitor Audio Bronze 2s. When discussing the sonic merits of this Bluesound suite, we often begin our reviews by talking about the open soundstage and full-bodied presentation. So, while it no longer comes as a surprise to be washed in such warmth, it remains a consistently impressive performance nonetheless. The Powernode 2i combines that familiar presentation with the added detail we heard in the Node 2i to offer a bold yet insightful performance – ripe for analysis but willing also just to be enjoyed unthinkingly – without you even going to the bother of system matching. What impresses us most in both these units, though, is their tight grasp of timing and dynamics. The Powernode 2i is tight and rhythmic, picking out patterns and using the space in its presentation to let them breathe without becoming untethered in the overall composition. There is added punch and authority too, tempered well when extra subtlety is required, which makes for an even more confident and entertaining performance. Kicks aren’t merely forceful, but struck through with the laces, making most of Bluesound’s trademark low-end generosity to drive a track and set an unwavering tempo. Dynamics are equally bold, contouring swells and stabbing at those more immediate shifts for levels of expression we didn’t think were possible from a system at this level. Handling of vocals often highlights that kind of dynamic aptitude, so the personality present in the Powernode 2i is hugely to its credit. Regardless of its setting within the context of Bluesound’s multi-room family, you’d need a four-figure budget for a streamer and amp combination before it could come close to bettering the performance of the Powernode 2i. 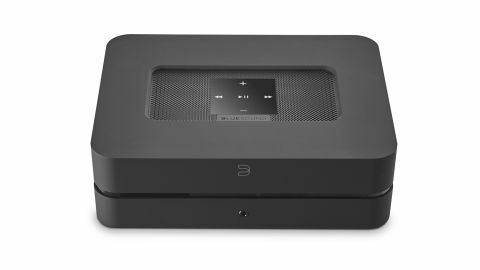 If the Award-winning Naim Uniti Atom is out of reach, Bluesound has come to the rescue with another one-box product that refuses to compromise in any single area, representing another superb all-rounder on a smaller budget. Often a little tinkering pays greater dividends than a whole raft of changes, but we doubt even Bluesound could have foreseen just how successful its comparably minor alterations to the Powernode 2i would be. It is easily a five-star product, and with quite a bit of room to spare.